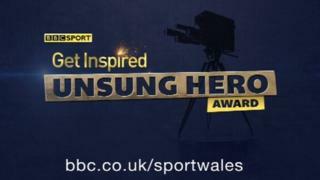 The BBC Cymru Wales Sports Unsung Hero Award celebrates people working behind the scenes to make sport accessible to all. Do you know someone who, for no personal reward, inspires people to get involved in playing sport, maybe unearthing a champion of the future or who is just keeping a local team or club going behind the scenes? Nominations for the 2014 Awards are now open. Put forward someone you know or work with by completing this nomination form, or for the form in Welsh follow this link. See the 2014 Get Inspired Unsung Hero Awards terms and conditions to find out everything you need to know. The closing date for applications is 23:59 BST on Monday, 20 October. You can also call 0845 308 8000 to request that a nomination form is posted to you. Calls cost up to 5p/min from most landlines (an additional connection fee may also apply). Calls from mobiles may cost considerably more. Please note that the last day we will dispatch posted nomination forms will be Friday, 17 October.